A motley crew of pesterers and swindlers for you this week! There’s no rest for the wicked and therefore no rest for your phone either. I believe the correct term is ‘ambulance-chasers’. Caller number two, calling from 02081509083, is a mysterious gentleman who seems to have trampled over colleagues and customers alike to achieve his financial goals. Under a plethora of identities and company names (most of them false, it seems), this caller has created himself a reputation that goes before him. don’t touch this guy with a bargepole!!!! dodgy investments and a nasty habit of ripping you off and never paying you back. steer well clear. villas, golf courses, murky dealings in Spain… not to be trusted. If you hear any of the following names: Morgan Forbes/Pearl Island/First Capital Wealth/Hugh Herschell, alarm bells should ring! Remember, these sorts of people make money by being charming, so keep your wits about you! Sombrely bringing up the rear is caller number three, a company called OTPL, on 0280697934, who are selling – wait for it – funeral insurance. Like a gaggle of very persistent vultures, they’ll hover over your phoneline, calling you several times a day, for that extra dose of doom and gloom that we all need on an November day. Keep saving these numbers under ‘time wasters’, or blocking them altogether if you can. 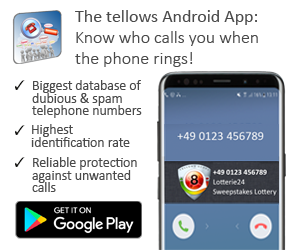 Knowledge is power, so if you’re unsure about a caller, pop the number into tellows.co.uk and see what other users are saying about the caller. This entry was posted in Weekly Top 3 Nuisance Callers and tagged annoying, cold calls, fraud, nuisance calls, pensioner, scam method, spam numbers, telephone numbers, tellows.co.uk, Top 3, weekly on Tuesday November 5th, 2013 by ellen. 21st October 2013 brought good news for all phone-owners as British regulator Ofcom joined forces with international regulators in the UK, USA and Canada to crack down on ‘spoof’ callers. Ofcom and the Information Commissioner’s Office (ICO) will be working with the US’s Federal Trade Commission (FTC) and Federal Communications Commission (FCC), Canada’s Competition Bureau and the Canadian Radio-television and Telecommunications Commission (CRTC). This new task force aims to share international resources and knowledge to tackle nuisance callers’ stranglehold over phonelines the world over. Spoof calling, for those unfamiliar with the term, involves using a nifty bit of software to mask the number you’re actually calling from, in order to prevent the recipients of your calls being able to locate you, or call you back. This is of course, infuriating for those of us badgered incessantly by anonymous callers. What’s even more infuriating is that whilst some spoofers use gobbledegook numbers instead of their own, others have really taken the biscuit and tactically use well-known organisations’ digits to execute some quite remarkable conning manoeuvres. SILENT CALL and if you try and call it back it is unrecognised. Looks like a scam or a spoof. The BT 1471 read this number correctly but it is duff. Commenting on number 01618149908, user Dawn mentions another standard spoofing tactic: hiding a phone number with a bad reputation and using an as yet ‘clean’ one so you aren’t forewarned when the phone rings. If you’ve been called by 000-000-0000 (or another unlikely-looking number), it’s highly probable that the caller was using spoofing technology. Difficulty in tracking down spoofing culprits is increased thousandfold by the fact that the origin of the call is completely untraceable. Without an area code, there is generally no way of discerning where or who a call has come from. This means that internationally-placed spoof calls are becoming increasingly common: hence the transatlantic team-up. The member organisations will pool resources, share information and work in collaboration with telecommunications industries in their respective countries to target and reprimand offending organisations. Guidelines on what constitutes ‘misuse’ of the spoofing technique are also being reconsidered, revised and made much clearer, with a view to introducing tougher punitive measures: monetary penalties of up to £500,000 are being considered for foul-players. 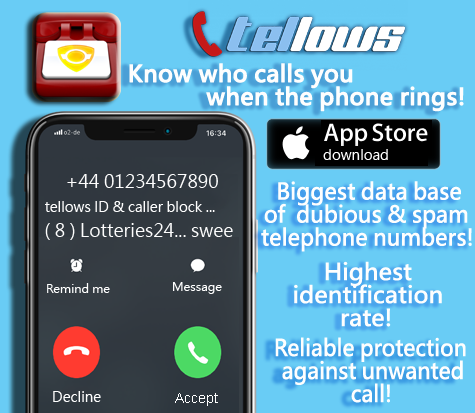 In the UK, US and Canada, all telemarketers are legally obliged to identify themselves, meaning that spoofing, and also number-concealment, are against the law. Always be on your guard with unknown callers and watch out for the warning signs: are they trying to weasel information out of you, personal or otherwise? If they claim to be calling on behalf of a service you use, ask yourself if this is how they normally contact you. Try to call back on the official company number if you’re in any doubt at all and never respond to threats or implausible claims. This entry was posted in Knowledge and tagged fraud, methods of fraud, Ofcom, personal information, scam, telephone, telephone numbers, tellows.co.uk, weekly on Tuesday November 5th, 2013 by ellen.